I posted this picture of The Poisonwood Bible in my anniversary day picture recap from last month and got a fair number of comments about it. Some people said they really liked it; others said they didn't. At that point, I was about three quarters of the way through and enjoying it quite a bit. A few people expressed interest in hearing my review once I was done, so here you go. First of all, I realize I am waaaaaay behind on this. I mean, the book came out in the late 90s. (SO long ago, right?) I've had it on my to-read list for years and kept putting it off for some unknown reason since I had no idea what the book was even about and therefore had no reason to not get around to reading it. I finally finished it after renewing it once at the library and still incurring a 10-cent fine for returning it two days late. I'll tell you why I think that happened later. The Poisonwood Bible is set mostly in the 1960s and is the story of the Price family, who travels to a village in the Belgian Congo to be missionaries. Each chapter is told from a different point of view of one of the four daughters: Rachel, the oldest and a vain primadona; Leah, one of the twins, tomboyish and outspoken; Adah, twin to Leah, intelligent despite being crippled and mute; and Ruth May, the youngest. Their mother, Orleanna, narrates the introductory chapter of each section. I absolutely loved the way this book was structured. The sections and choice of point of view throughout the story was excellent. The father, Nathan, doesn't narrate, so we only see him through the lens of each of the women. The reason for this become clear later on. The book seemed to move at a relatively quick pace for most of it, even though at one point I found myself wondering why it moved fast, because they weren't actually doing a whole lot. As far as plot line goes, there wasn't much too it; but the narrative is full of religious theories, interesting characters, and fascinating culture, which kept me interested. Once the family (*spoiler alert*) leaves the village and embarks on the rest of their lives, everything slowed way down for me and I felt like it took forever for anyone to do anything. It was at this point that it became clear that the book wasn't going to be a necessarily happy ending as I like to think of happy endings. I've realized this about myself, even more over the past few years: that for my personal reading, I like a book with a happy ending. I sometimes think people look down on that, as if it's not "literary" enough or whatever, and I do appreciate authors who take risks and kill off favorite characters (George R.R. Martin, here's looking at you). Although I'm not necessarily saying everything has to wrap up neatly in a pretty bow, I do tend to prefer a book that has a more optimistic ending. It's hard to explain how I feel about endings in a way that makes sense to anyone but me. It's just a feeling I get--a sadness about the way a book ended. I guess I feel like I didn't get the proper closure I wanted, or even if I did, I was left with a nagging feeling disquiet, as if the characters will always live with a sense of grief and loss had things not been different. But I guess that's real life, so maybe that's how it should be. I don't know. In any case, that's how I felt about The Poisonwood Bible, which is why at the end of it all, after I closed the final page, I didn't LOVE it. I'm still glad I read it, I enjoyed reading it, and I would recommend it to someone else. But I wouldn't read it again. And....I think that might have been most unhelpful book review ever. 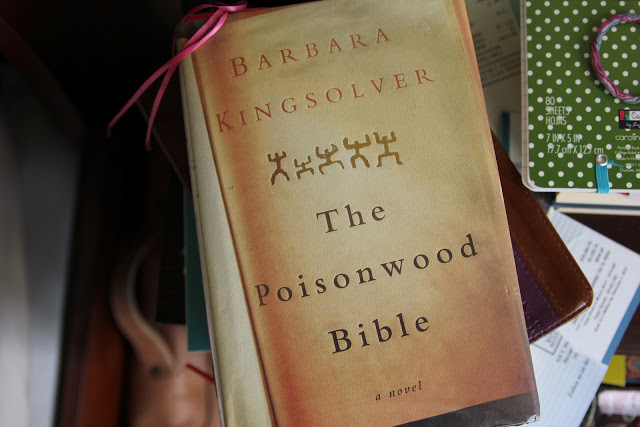 Have you read The Poisonwood Bible? What did you think? What type of ending do you resonate with the most? I read The Poisonwood Bible as part of a summer reading assignment for my AP English course in high school, and I haven't picked it up since then. I am in the same boat as you as far as, "Wouldn't read it again, but I'm glad I read it". However, I don't tend to reread books because I like to be surprised as I read, haha. I didn't think the ending dragged, per se, but I did find it to be a downer. However, I think that it was fitting for the arc of the story, and had everything turned out sunshiney and wonderful, it would have made the rest of the story less powerful, I think. I won't say that I "prefer" sad or "downer" endings, but I really can't stand when everything just wraps up in a neat little bow. I guess I like endings that make SENSE with the rest of the book... but who doesn't? Haha. What's up next on your reading list? I read this year ago on a trip to Mexico & it was the perfect juxtaposition between the worst & the best (in my opinion) approach to mission work. I like the writing a lot, but it was extra special because of that. And years later I used to to squash the world's largest beetle that flew into my apartment, so I also appreciate it's girth. i haven't read it but it seems to be an interesting book. i've never heard of that book before. i agree though I don't love when books end without a sense of closure or how you think they should end! Hhhmmm. You've definitely got me intrigued! Putting it on my list of book to read!